I completed a PhD at De Montfort University, Leicester. in 2010. My PhD was based in the Faculty of Art and Design and was the subject of an AHRC studentship award which the department nominated for photographic history, building on the department's active research programme and success in the field. My decision to undertake formal study was a long-held ambition. My research topic was an examination of the growth and development of British photographic manufacturing from 1839 to 1926. This topic built on my long-standing photographic research interests and is an area of photographic history that has hitherto remained unexplored by other historians in any significant way. There are some studies relating to the United States and to France but the absence of any significant work relating to Britain is an omission which needs rectifying. The poster presentation which can be downloaded here summarises the areas I am looking at. How did the industry develop from nothing in 1839 to a specialized manufacturing companies? How did the production of equipment and sensitized materials move from hand manufacture to mechanized manufacture? What was the market for photographic goods and how did this drive the development of the industry? How did the rise of amateur photography from the later 1880s impact on manufacturing and retailing? any nineteenth century photographic company trade catalogues, company archives or documents relating to photographic companies and the manufacturing and retailing of their products. Archives or company documents or manufacturing statistics/data for the following companies: J Lancaster & Son, Birmingham; Warwick Dry Plate company, Austin Edwards; Houghtons Ltd; W Butcher & Sons; Jonathan Fallowfield; photographic retailers; dry plate companies; camera and equipment producers. 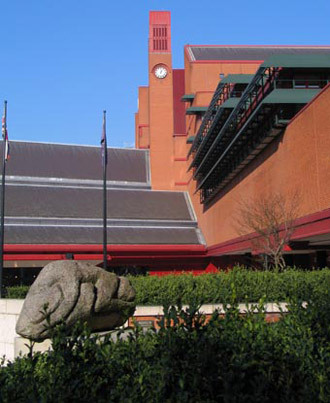 The British Library, St Pancras, where I spend days working through books and periodicals held there. 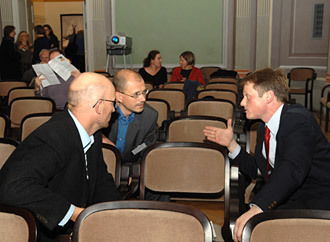 In conversation after presenting a paper at the European Society for the History of Photography conference in Vienna, November 2008.